For long spline drive shafts with no CV click here. For Super High Angle CVs click here. Please note that in the following descriptions in most cases the vehicle model is not mentioned because the Drive Shaft Superstore can fit any drive shaft on any vehicle. If a certain transfer case yoke or differential yoke does not exist we build it. 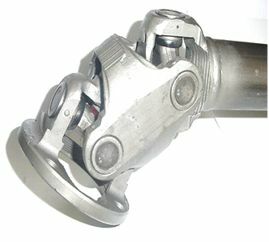 All drive shafts are possible given a minimum amount of space to install it. Note that the options of long splines and high angle CVs are not vehicle year/model dependent. They can be put on any drive shaft. It is expected that the buyer has studied his drive shaft or requirements and knows a little of what he wants. Our website is designed to inform the buyer what these drive shaft assemblies do and when they are used. Your order form will ask some of the questions below, as applicable. Do you want high angle? All drive shafts are complete with U-joints and precision balanced. All drive shafts are (greaseable unless otherwise requested). All drive shafts are built to a working length you provide us and the strength and u-joint requirements you need. There are no returns on custom drive shafts. However, we can credit toward another upgrade. For example, if you buy a BAD BOY drive shaft and it doesn’t fix as you thought, we'll make you a BAD BOY JUNIOR and we'll credit the BAD BOY against the JUNIOR. Make sure that the information given to us is correct. We guarantee workmanship and that the product will perform to the specifications. For Jeeps, Fords, Chevy’s transfer cases, you need to swap the transfer case u-joint style output yoke with an appropriate size END YOKE which is FOUND HERE when you add a CV style drive shaft.. If you can't find it call us.. The drive shafts below are built for the vehicle you described in the vehicle identification page. For example, if you say you have a 1982 Toyota, the hole patterns are assumed to be 2 ½ by 2 ¼ at the differential flange. Note, DO NOT PANIC, if you don't know much about this stuff, and the information is incomplete, we will call you. You can do nothing wrong, we guarantee correct product delivery. It will be up to us to see that the product is correct as long as our question to you are answered accurately..
No work is started until we all agree we have the information we need. When do I need a high angle. (Rule of thumb). FRONT or REAR: Lifts between 4 inches higher or when the angle of a single is 7 degrees or greater. When do I need long travel. Rules of thumb. When the extension (or travel) exceeds 2 inches. When you have build the vehicle for high articulation or high movement of the differentials with not torsion bars. Usually for rock crawling and off-road racing sports. What is standard spline versus long spline? Answer: 3.5 inches total versus 7inch working travel. We have up to 26 inches of travel if you need it but it costs more. WHEN COMPARING OUR HIGH ANGLE TO THE COMPETITION, MAKE SURE IT IS 35 FOR SAGINAW AND 40 DEGREES FOR THE SPICER TYPE. ONE SIGNIFICANT LABOR FACTOR ON OUR HIGH ANGLE DRIVE SHAFTS IS THE AMOUNT OF MACHINING THAT WE DO TO MAKE OUR PRODUCTS FLEX AS WE SAY AND TO MAKE THEM LOOK PROFESSIONALLY FINISHED. 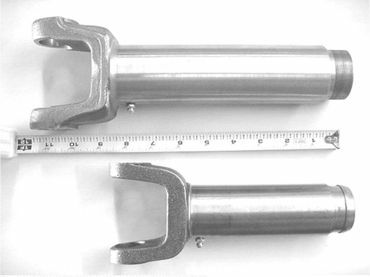 THIS IS THE LONG SPLINE FORGED YOKE THAT GIVES YOU 7 INCHES OF WORKING TRAVEL VERSUS 3.5 INCHES IN THE INDUSTRY. 1.5 INCHES DIAMETER 10.5 INCHES LONG. CLICK HERE FOR MORE INFO ON 40 DEGREE CV? This one shows long splines only for lack of a better picture. This will bring 9" of 16 spline with 7" of working travel. This 16 spline is used to high speed performance to reduce vibrations that a 10 spline may contribute. The 10 spline is not as tight as the 16. Spline longer than 9" we switch to 10 spline and can provide up to 26 inches of travel. Which you ask for in the comments section of the order. Each addition of 4" of spline will cost $40. This a standard Saginaw high angle CV that has been cleared for maximum angle of 35 degrees. Above is a standard Saginaw built out of spicer type parts outside clips. 40 degree can be achieved. THE PRICES BELOW ARE FOR THE COMPLETE AND PRECISION BALANCED DRIVE SHAFT EVEN THOUGH SOME JUST SHOW THE CV. This drive shaft fits your flange at the TC and what ever uj you have at the pinion. This drive shaft fits your flange at the TC and the u-joint half ton 1310 at the pinion or whatever you have. this is the CV used and it has spicer type U-joints and it fits your Saginaw flange.